The AP Drawing Portfolio is an intensive course, requiring students to produce art at the college level. Students compile a portfolio of 24-29 original artworks demonstrating mastery in composition, technique, and concept. Twelve of those pieces explore a common idea called a concentration. Caroline Johnston ’19 has been a part of the Art Department since ninth grade. Her work has been hung in the Munnerlyn Gallery, the Library Gallery, and the Head of School Gallery. 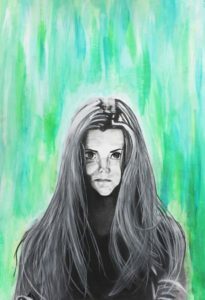 Caroline’s works recently won a silver medal regionally from among 2,800 other high school artists. I have struggled to figure out how to connect my artwork in my concentration to a specific feeling. This is because when I think of art, I think of bright colors. However, I am using charcoal. I decided to add colors to the backgrounds of my work so it could express my emotions and the freedom I feel while still drawing black and white portraits. 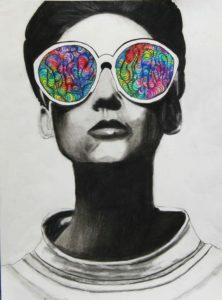 I know that sometimes it can be hard to see things from a black and white perspective, so one of my pieces has a girl with colorful sunglasses. 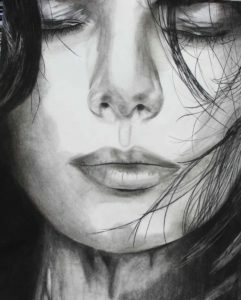 She represents me and how I see emotions in color although the portrait is black and white. The glasses include all the background colors I used in the pieces that express a feeling for me. Even though my pieces express what I feel I also left them with an open intention so the viewers can have the freedom to express what they feel when they are looking at art as well. I enjoy using charcoal as my main medium. The reward of the final touches is so exciting to watch when the whole piece comes together. Certain colors normally give off a feeling or emotion. By leaving my work black and white, it allows me to express my emotions while allowing the viewer to use the color to feel something maybe someone else does not. A touch of color in my work demonstrates freedom and emotions that I and the viewers have. How has your concentration changed? It has been hard to find something that I am excited to talk about while still being able to tie all of my pieces together. I have gone back and forth between how to unify them. However, I’ve learned my work represents how I see and express what I am feeling through the girl with colorful glasses. Her glasses look out upon all the other pieces that represent my feelings.